If you have some peaches in your kitchen slightly past their prime, try this Amazing Amaretto and Fresh Peach Frozen Greek Yogurt. If you don’t have any Amaretto in the house, no worries. It will still be completely delicious if you substitute almond extract! 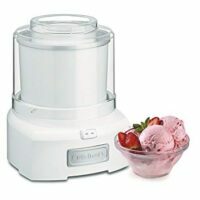 Have you ever tried making your own frozen yogurt? It tastes so good at the frozen yogurt shop. How do they make it taste so good? I’m suspicious. Ever since I’ve been making Greek yogurt at home, I’ve been on the hunt for a good yogurt ice cream recipe. Up to now, most of them were a disappointment–as in a weird texture. After several experiments, I’ve found a combination I like. The peaches are totally fresh–never cooked. 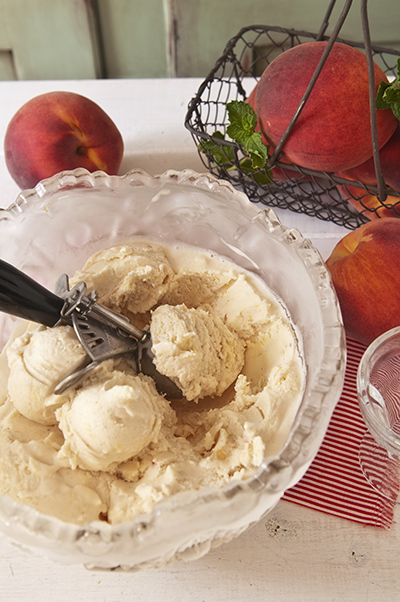 While cooked-down peaches may have a more intense flavor, freshness is more important in ice cream. At least that’s the way I see taste it. Use homemade or Greek yogurt you buy from the store. You can also strain regular yogurt until you have Greek yogurt which is thicker. Amaretto helps to prevent the yogurt from freezing rock hard. 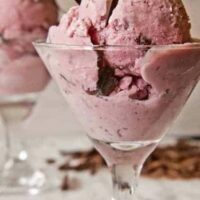 If you want to know more about this, David Lebovitz writes a good article entitled Tips For Making Homemade Ice Cream Softer. If your frozen yogurt is too hard to dip the next day, a few seconds in the microwave or a few minutes on the counter will remedy the problem. 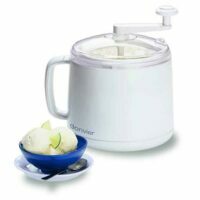 My favorite ice cream freezer is a Donvier hand crank freezer. It’s easy, doesn’t take up much freezer space and is portable (non-electric). It is small-ish, but perfect for a smaller family without too many leftovers. After mashing peaches, stir in sugar and lemon juice. Set aside. Combine yogurt, milk, cream and sugar stirring until sugar dissolves. Add vanilla, Amaretto and mashed peaches. Chill. Freeze in small ice cream freezer according to manufacturer directions. Make these easy Ice cream balls rolled in toasted pecans ahead of time. 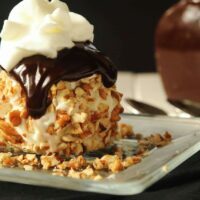 Serve with hot fudge sauce and whipped cream. A fun idea for showers and parties. 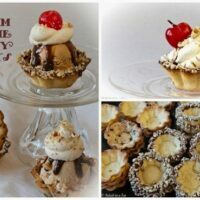 Everybody makes their own ice cream sundae starting with a novelty mini-tart shell. I recently made an Ameretto Peach Jam and I love the flavor combo. I bet this fro yo is excellent! 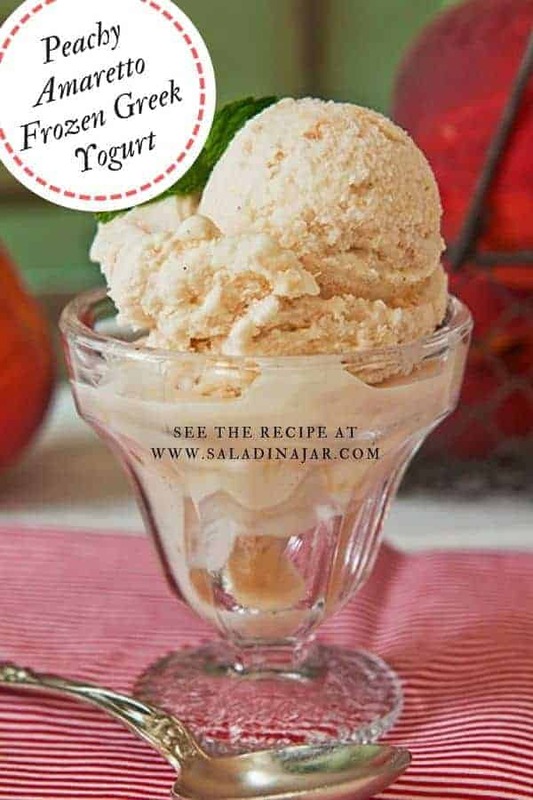 I have some ripe peaches just waiting to be transformed into this delicious frozen yogurt! Hi Paula—I am new to your blog, which I shall enjoy exploring. First–of course–is your great recipe and tutorial on Greek Yogurt making, which provide a foundation for so many delicious things. Many thanks! 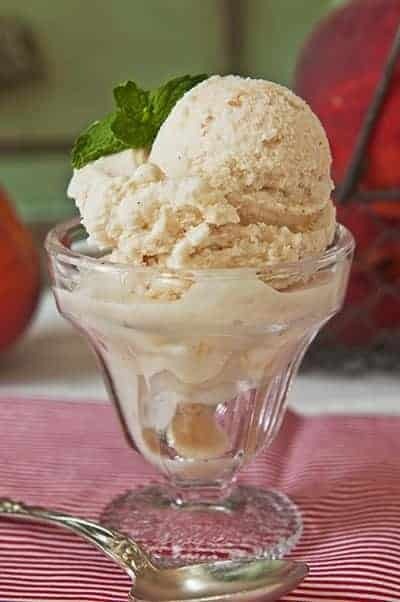 I had peach ice cream one time at a dairy thats very close to me, i liked it. 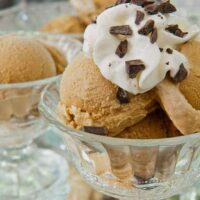 Even though fall is around the bend does not mean you can not eat ice cream, ill even have some during the winter. Richard from the Amish community of Lebanon,pa. What would be a good substitute for the Amaretto if you can’t have alcohol? Taz, Great question. Add a little more almond extract if you want more almond flavor. However, the primary purpose of the Amaretto is to keep the frozen yogurt from getting rock hard the next day. Leave it out if you don’t have it or prefer not to use it. I completely understand. Yum, yum, yum,Paula! You’ve outdone yourself once again! This looks simply incredible! To my complete shame, I haven’t used my ice cream maker once this summer. This recipe looks like the perfect excuse to dust it off. Amaretto and peaches are such a great combination!